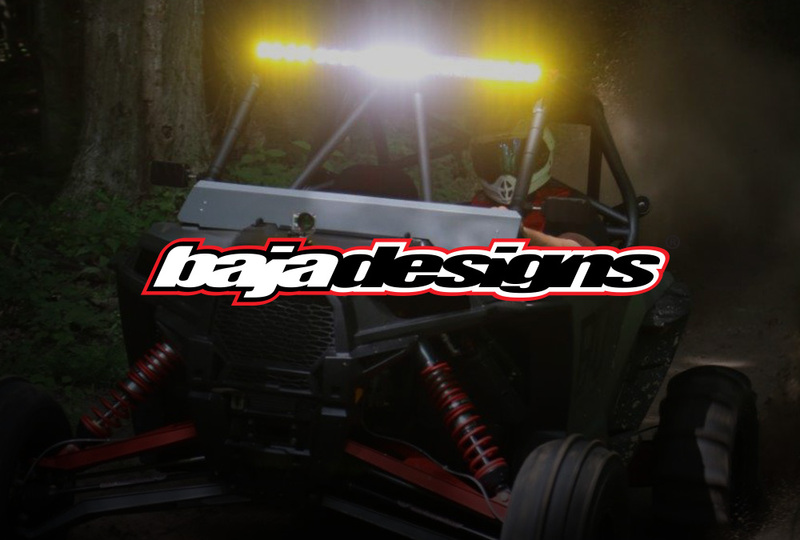 New Polaris RZR XP 1000 » Bad Motorsports Inc. Since the introduction of the RZR 800 for Model Year 2008, Polaris has defined and led the recreational side-by-side market. Since that first launch, the company has consistently introduced models with unmatched performance which are highly sought after by off-road enthusiasts. RZR side-by-sides are the gold standard in recreational vehicles due to their ultimate combination of power, suspension and agility for trail, high performance and multi-passenger recreation. Today, Polaris announces the launch of a RZR beyond compare, the 2014 RZR XP 1000! Pictures are after the click! The new RZR XP 1000 brings significant innovations to each of the hallmark Power, Suspension and Agility aspects of RZR. PLUS, the RZR XP 1000 adds an entirely new level of interior comfort and accessory customization to give riders the premium features they deserve. And all for $19,999 US and $22,699 Canadian! For unmatched throttle response and acceleration, the ProStar 1000 was developed with dual 48mm throttle bodies with new long tip fuel injectors, ensuring each cylinder is supplied with the air and fuel it needs to produce unmatched power on demand. To deliver that power to the wheels, the RZR XP 1000 has an ultra-efficient driveline featuring a retuned, high performance PVT system to distribute the massive107 horsepower from the engine to the transmission. Polaris also specifically geared the transmission to optimize the power of the ProStar engine. With greater than 80 percent of peak engine torque available from 3500 to redline, the RZR XP 1000 has huge torque on tap for the most aggressive dune and desert riding. 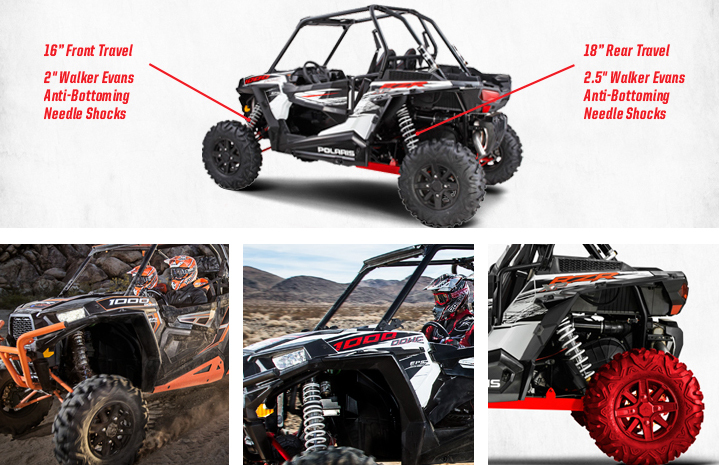 To fully utilize the new-found power, the vehicle needs suspension and agility, and the RZR XP 1000 delivers in true RZR fashion. The unit boasts the most advanced suspension for the most control and smoothest ride at any speed. To float over bumps, the RZR XP 1000’s 3-Link trailing arm rear suspension features upgrades in both geometry and design offering 25 percent more ground clearance at the trailing arm and giving the vehicle a whopping 13.5 in/34.3 cm of ground clearance. The new 3-link geometry allows surface-hugging grip as the vehicle pulls through corners from the use of optimized camber gain, and the increased length of the new trailing arm provides a better ride and additional strength. Up front, the RZR XP 1000 features an exclusive front suspension geometry that results in less steering effort for easy maneuverability. The RZR XP 1000 conquers whoops and soaks up chatter with its 90 in/228.6 cm long wheelbase and industry-exclusive 29 in/73.7 cm Maxxis Bighorn tires on all new 14 in/35.6 cm cast rims. The larger tire provides both better ride and higher resistance to pinch flats. For a near-bottomless feel, the RZR XP 1000 boasts industry-exclusive Walker Evans Position Sensitive Anti-Bottoming Needle Shocks on all four corners. These exclusive shocks feature piggyback reservoirs up front and remote reservoirs in the rear that are 16-position compression adjustable with preload adjustability. These 2.5 in/6.4 cm diameter rear and 2 in/5.1 cm diameter front needle shocks are extreme performance shocks from one of the best in the business. Capable of handling high speeds and extremely rough terrain, the internal needles interact with specifically-positioned chambers allowing progressively more damping deep into shock travel to improve ride performance and increase bottoming resistance. The shocks are paired on all four corners with the dual rate/dual spring coil-overs for 18 in/45.7 cm of rear travel and 16 in/40.6 cm of front travel to provide a comfortable ride in all terrains. The RZR XP 1000 is the most responsive to the terrain and driver providing unmatched agility under all conditions. To ensure the vehicle’s High Performance On-Demand All-Wheel-Drive system could handle the industry-leading power and provide the ultimate in responsiveness to the terrain, Polaris revamped the system for an 80 percent improvement in strength. The result is the most durable front drive system ever found on a RZR. The system features a brand-new, close ratio final drive to keep the front wheels pulling stronger and longer maximizing power delivery to the ground in every condition. The system is seamlessly paired with standard Electronic Power Steering and nimble 18 ft/ 5.5 m turning radius to provide unmatched point-and-shoot handling making the vehicle very responsive to the driver. For even more control, the unit has quick, two-turn, lock-to-lock steering allowing the operator to showcase the point-and-shoot agility the vehicle has in response to all terrains. With industry leading acceleration and agility, the stopping feel and power must be precise. No one has ever delivered braking balance and performance better than RZR, and the new RZR XP 1000 is no exception. With dual piston calipers and larger 248mm ventilated discs on all four corners, the operator has unequaled confidence around every turn. The news doesn’t stop there! All this performance rides on an all-new tubular chassis featuring substantial improvements in stiffness and durability. On top of the chassis, is an all new interior designed for a more responsive feel for the driver, refined comfort, and features unique to the RZR family. The newly-designed seats offer substantially improved bolstering and 100 percent more hip cushioning for a more secure feel, and feature a new thin-film technology under the cover for a drier ride in wet conditions. Both driver and passengers will appreciate new seat sliders for tool-less, on-the-ready seat adjustment along with additional leg room, and space-optimized dead pedals for both the driver and passenger. The driver will appreciate a new, stiffer steering wheel designed for comfort and a more responsive feel. The RZR XP 1000 features factory-installed quarter doors designed for more elbow room and extra protection from debris. A high-strength, easy-access latch allows one hand operation and no-look closing. For improved adjustability, the unit features a new, innovative, flow-through tongue seat belt design that is easier to adjust and retract. The sealed belt retractor housing ensures the belts will endure through the nastiest conditions. Inside the cockpit, RZR XP 1000 owners will enjoy LED floor lighting and a slick blue back-lighted instrument cluster, readable both in direct sunlight and at night. To accommodate the need to stay connected, the unit features sealed smartphone storage that provides visibility of the display while protecting it from the elements and a 50 percent larger glove box to take more stuff along. 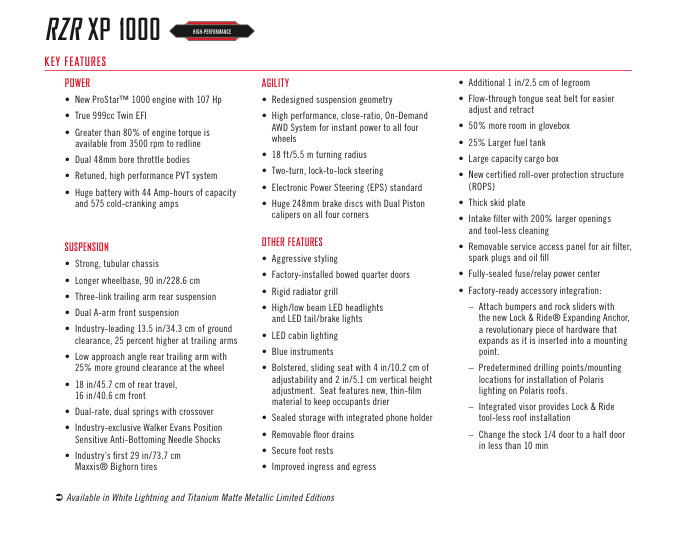 The RZR XP 1000 is easy to own and maintain as well. Sealed floor seams and equipment pass-throughs keep the occupants cleaner; while dual removable floor drains allow for easier clean out of the cabin. For faster access, the fully-sealed fuse/relay power center is located under the driver’s seat and will withstand the toughest elements. A bigger cargo box with more tie-down points enables more cargo capacity, while an integrated whip flag mount makes attachment easier. And, an all-new 9.5 gal/36 liter fuel tank that takes 87 Octane gives you 17 percent more range, which means more fun, longer! RZR enthusiasts love to accessorize their vehicles and the RZR XP 1000’s large charging system, integrated accessory mounting locations, hidden wire routing areas within the cab frame and more than 75 exclusive accessories, takes customization to a new level. The purpose-built vehicle chassis is exclusively engineered for Polaris accessories. With integrated mounting points situated along the vehicle frame and pass-through areas for routing wires, accessories can be attached with minimal installation time. Additions, such as rock sliders and bumpers, easily attach and fit securely to the vehicle’s frame due to Polaris’ innovative Lock & Ride® Expanding Anchor; a revolutionary piece of hardware that expands as it is inserted into a mounting point. Lock & Ride® windshields, rear panels, roofs and doors work seamlessly with each other and install directly onto the vehicle frame’s designated mounting points, making installation simple, and providing superior fit and finish. To run an abundance of accessories for the ultimate riding experience, the RZR XP 1000’s battery features 575 cold cranking amps and 44 amp-hours of capacity. 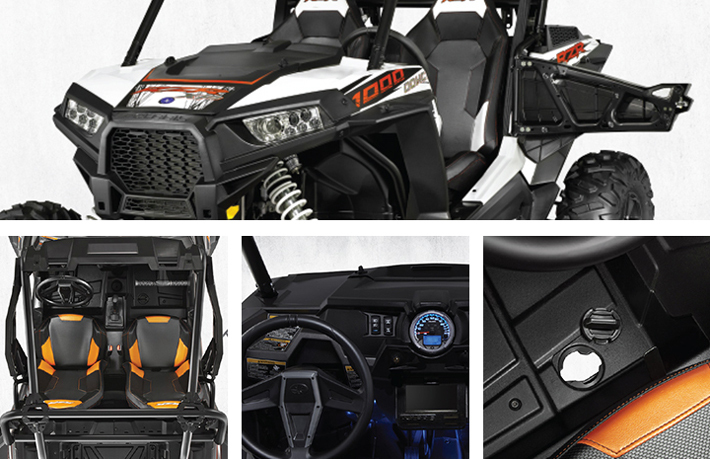 A keyed power-only accessory feature also has been added to prevent draining the battery, and a 3-post terminal under the hood allows for quick and easy wiring of powered accessories such as lights or the new Polaris premium MTX® audio system. The system features two 60-watt overhead enclosures with four marine grade speakers and tweeters, a 300-watt subwoofer, Bluetooth connectivity, a full audio display and two fully-sealed dry storage lockers. Wires are routed through the cab frame and connect directly to the 3-post terminal with a custom designed wiring harness, making installation easy and fully protecting wires from off-road hazards. Other Polaris Engineered Accessories such as the RZR XP 1000 overhead bag and side bag, and two new wheel and tire options ensure the ultimate in customization. 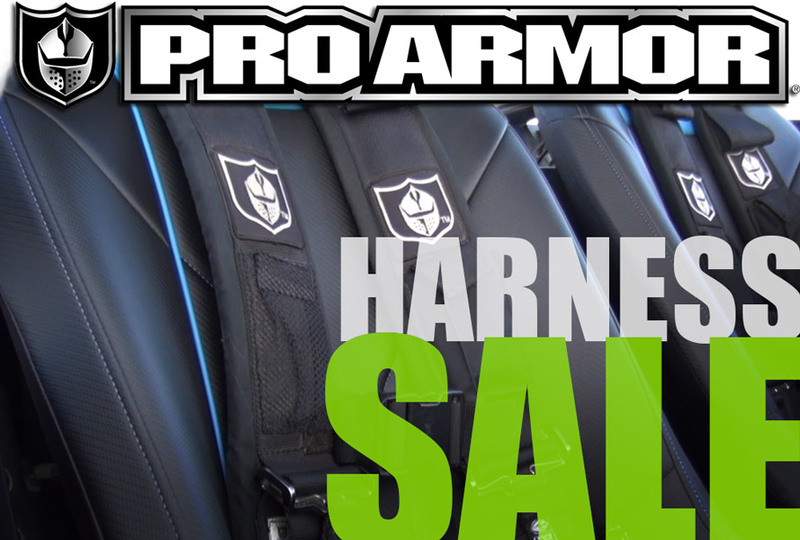 The new cargo bags have weatherproof zippers to protect belongings from the elements and possessions are easily accessed while sitting inside the vehicle. Velcro® attachment rings allow for easy installation and removal of the storage bags. The durable, high-traction 15 in/38.1 cm Kanati Mongrel tire is a true 30 in/76.2 cm tall featuring advanced radial construction for the best ride and superior traction. The 15 in/38.1 cm HEXLR 2-Piece Beadlock wheels are available in a machined matte black or titanium finish, and feature forged steel bolts and lock washers for aggressive riding. The beadlock rings are available in White, Indy Red or Orange Crush.